From January 1, 2012 through September 16, 2013, a total of 231 “million dollar plus” homes sold in Maui County, generating total volume in excess of $525 million. There are many ways that Hawaii real estate appraisers analyze sales statistics for luxury homes. Because a proper market study for this segment would run many pages, I am posting one article per day for ten days. Today marks the last day of my series on Maui’s high-end luxury homes. I had to testify in a ground rent arbitration yesterday, so this article is coming a day late. Thank you so much for reading along with me. As shown, just over ten percent of the million dollar plus home sales on Maui front the ocean while another are located across the street from it. But the balance of the Maui luxury residential market is located mauka, or toward the mountains. 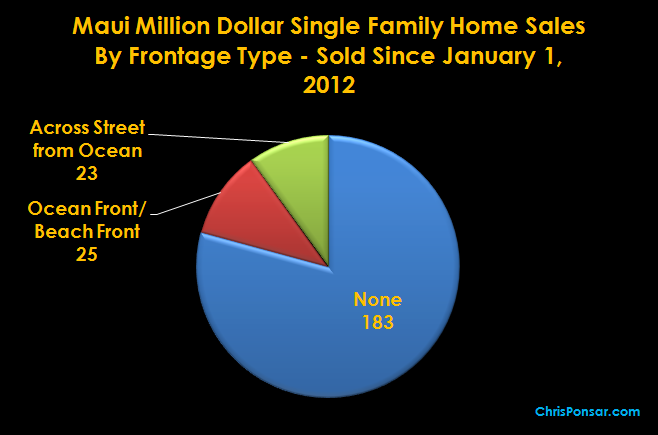 Bottom Line: Not every million dollar home on Maui is on the beach–the large majority are located on interior lots. I hope you’ve enjoyed reading this “mini-series” of posts, it was fun to assemble and provided a few insights that I wasn’t expecting, particularly the days on market figures that showed reasonably fast absorption of most Maui high end properties. Questions or comments? Please leave them in the comment box below, I would be happy to clarify and/or expand.